Academy Award-winning Passion Pictures and HHMI Tangled Bank Studios present one of the most important but untold science stories of our time?a tale with profound implications for the fate of life on our planet. Beginning in the 1960s, a small band of young scientists headed out into the wilderness, driven by an insatiable curiosity about how nature works. 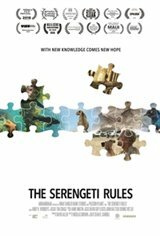 Immersed in some of the most remote and spectacular places on Earth?from the majestic Serengeti to the Amazon jungle; from the Arctic Ocean to Pacific tide pools?they discovered a single set of rules that govern all life.